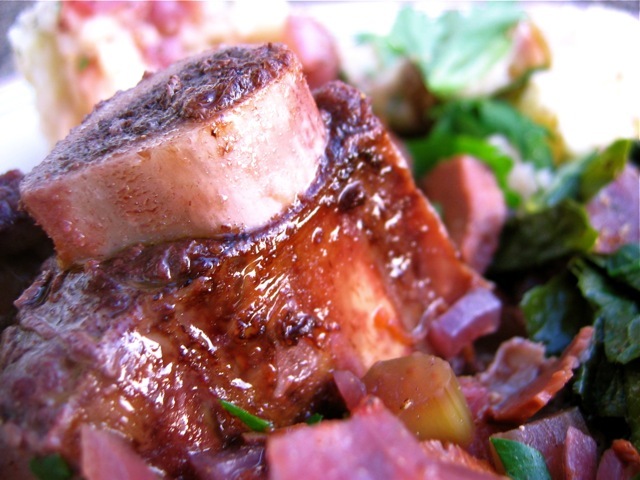 If you'd like to splurge on a rack of veal ribs for this recipe, you'll have excellent results. Substitute white wine for the red in the recipe. Forestier simply means "forest-style," or, in culinary lingo, that mushrooms (preferably wild mushrooms, straight from the forest) were used to prepare the dish. The familiar Italian dish chicken cacciatore ("hunter-style chicken") also relies on a similar sauce of tomatoes and mushrooms. In a low, wide, thick-bottomed pan, heat the olive oil over medium to medium-high heat for 2 to 3 minutes. Try not to let it smoke. When the oil is hot, add the ribs, fat-cap side down, and sear to golden brown (about 5 to 7 minutes). Turn and sear the other side the same way. Remove the meat to a warm plate and turn the heat to medium. Add the onions, carrots, celery, garlic, bay leaves, parsley, and thyme, and sauté until the vegetables are tender and the onions are just turning golden, about 10 to 15 minutes. Add the wine, stir, and return the meat to the pan (fat cap up this time), resting atop the vegetables. Add enough of the stock to rise about ⅓ of the way up the sides of the ribs. Supplement with a little more wine or water if necessary. Place the covered pan in the middle of the oven and cook for approximately 30 minutes per pound of meat. During the last hour or so, add the tomatoes and mushrooms, gently stirring them into the liquid around the meat. When the meat is tender and almost (but not quite) falling off the bone, remove the pan and allow it to rest, covered, for about 20 minutes. Remove the meat to a platter, if beef, or cutting board to separate the ribs, if veal. Taste the liquid and adjust the seasonings as needed. Serve meat as is or over a starch (polenta, rice, potatoes, pasta) with some of the braising liquid as a sauce. Garnish with chopped parsley. Leftovers are great chopped up into the remaining liquid and served as a stew. If the liquid seems too thin, thicken it with a roux, if you wish.